The Lady Panther Lacrosse Club has been a part of the University for over 25 years and has built itself into one of the premier programs in the country that competes against excellent teams from all across the country. We play against other members of the Women’s Collegiate Lacrosse League (WCLL) , members of the Women's Collegiate Lacrosse Associates (WCLA) , as well as varsity teams from the Division I, II, and III levels. The games against other club teams in our league count in the statistics that determine whether the team receives an invitation to the regional playoffs each year. We have attended the WCLL regional tournament every year since 2006. The women won the WCLL championship in 2006, 2013-15, 2017, and 2019. In 2003-04, 2006-08, 2011, 2013-19 the team attended the WCLA national tournament, 13 total appearances, 7 straight. In 2014 Pitt won the National Championship for the first time and finished as runner up in 2017. We look forward to a successful 2019 season and another run at a national championship! While the team concentrates on winning games, we are about having fun on and off the field as well! We are open to girls joining our team until January, when our roster is due. The team practices at least twice a week and requires additional conditioning. 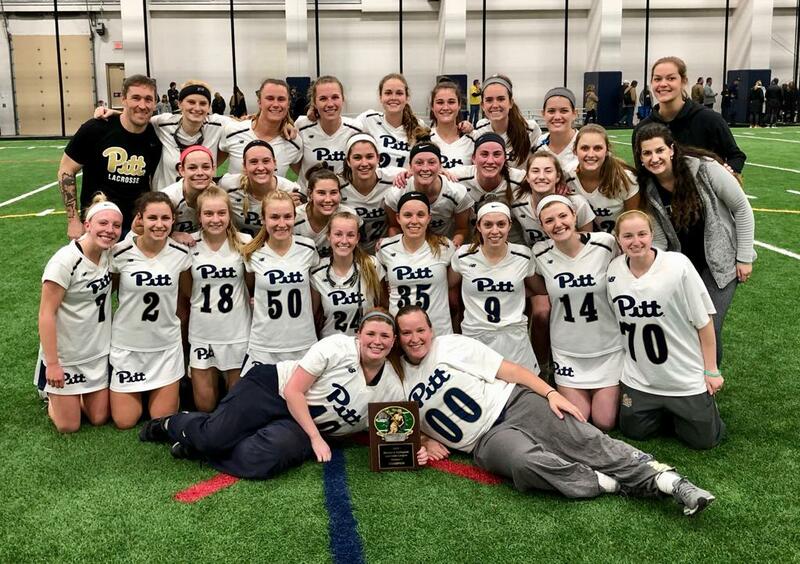 The University of Pittsburgh Women's Club lacrosse team offiicially kicked off their Spring 2019 season last night with their first practice of the year!! The team is excited to get to work prepping and getting everything ready for the start of competition. The team had another full day with three games against NCAA D2 teams this past Sunday. Pitt had games against Seton Hill University, Alderson Broadus University, and Wheeling Jesuit University. The University of Pittsburgh Women's Club lacrosse team started their fall season off with four games against NCAA D2 teams this past Sunday. Pitt had games against Gannon University, Slippery Rock University, Edinboro University, and Indiana University of Pennsylvania. Welcome to the start of another season and we have a lot of new faces joining us this year!! Along with the usual group of incoming freshman, transfers, and new players for the 2018-2019 season we have also added two new coaches. Erica Wilkerson is making her return to Pitt after graduating in 2017 and spent the last few years establishing a career and one season coaching at Carnegie Mellon. We are excited to have her aggressive style and no nonsense attitude back on the sidelines this year. Devon Schneider will also join the team as a new offensive coach after graduating from Florida in 2016 and spent the last two years coaching at Kennesaw State and then Temple. Pitt is looking forward to using her knowledge of the D1 game and helping us adjust to the new rules! !